So, I really love the Dark Tower series. I’ve read the books twice (I read the first three before the 4th came out, then read them again when the fourth came out, and then all of them again before book 7 came out). I’ve listened to the audio books, twice, and am listening to them again on my work commute. I’m currently on book three. I also own some of the graphic novels, but am more interested in the earlier ones, which filled in the gaps of the story, rather than the ones which re-tell the story in graphic novel form. I’m not a huge fan of the graphic novel style, and prefer the details of the books. As I was listening to the audio book this morning, something occurred to me. There are many reasons I love the story, the universe, and even how it ended (I know many people don’t like many things about how it ended, or even the direction Stephen King went with the later books), but something else poked it’s head out at me about the series which has, perhaps unconsciously, created a set of expectations about how the concept of family has formed for me. I will not give any major spoilers, but if you plan of reading the books, graphic novels, etc in the future and don’t want to be spoiled at all, skip this. 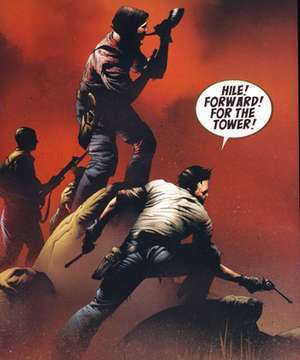 Starting in book 2, we start seeing the formation of Roland’s little pack of gunslingers, on their way to the Dark Tower. We meet them, as they are drawn into Roland’s world through detailed and often deeply life-altering ways which expose the dark corners of these characters. Each character has to confront major personal struggles in order to find their way on the path of the beam, and each of them finds inner strengths through their adventure together. It is a metaphor, I believe, for the intimacy which people must share to truly be a part of another’s world, at least as much as we can be a part of each-other’s world. This is a story of people drawn together by what in the mythology of the universe calls ka, and is related to the concept of fate. As they become entangled into ka’s web, they become ka-tet. They are more than friends, more than family, and they are intimately connected in ways that only the closest of friends, family, etc ever reach. Any of us are lucky if we ever have one person who gets this close, and some people may have a few people who become as close as these travelers become in Stephen King’s fantasy. They, in short, are completely vulnerable with each other, sharing their lives, thoughts, minds, and bodies with each other in ways which defy distance and secrets (as well as actual possibility; it is fantasy, after all). In the end, they are as close as people can be to each other. There are moments of anger, regret, arguing, intimacy, victory….and defeat. But whether they will all reach their goal or not, whether their heart-breaking story ends well or not, all the while they were together, they were vulnerable and intimate with each other in ways that draw me closer to them, and has inspired me to become closer to the people I love, especially myself. They were all in, withholding nothing. Related to this, I have just started reading Brene Brown’s Daring Greatly at the recommendation of a friend, who daring greatly, recently reached out to us to reconnect. This book, and other resources of my continuing project of allowing myself to simultaneously find my inner ability to love myself and make myself more open, intimate, and vulnerable to other people, are stepping stones to a better me and a better life. 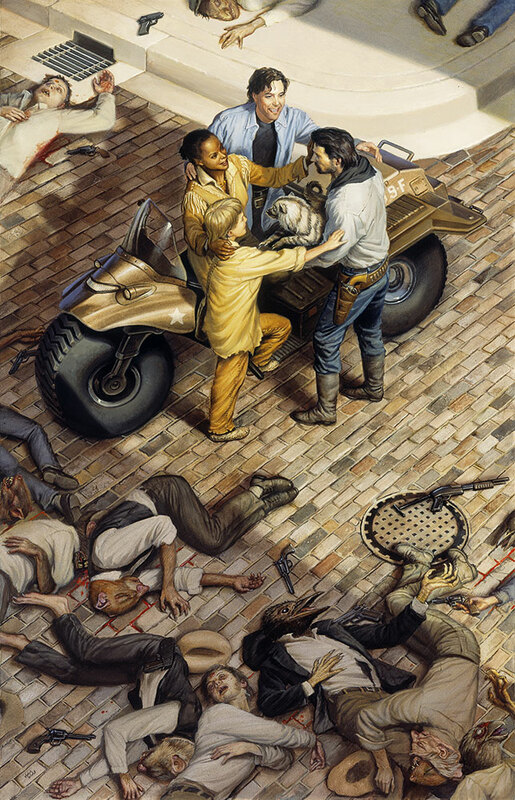 And as I was reflecting on these things over the last few days, I suddenly became aware of another facet of love I have for Stephen King’s magnum opus of a series; the concept of ka-tet. The characters in this story of The Dark Tower are imperfect, complicated, and all have traumatic personal stories. They overcome shadowy pasts of various kinds to find within themselves strengths that they needed each other to cultivate. They have all made mistakes, have the capability to do so again, but their relationships are built upon a level of sharing and honesty which has few parallels in our culture. This leads to a level of trust, respect, and love which acts as a mysterious goal of my own–a destination not unlike Roland’s Tower. We, in this culture, are not trained to be vulnerable, and so when we see true vulnerability we may admire it but find it difficult to do ourselves. Vulnerability, like responsibility, is an attribute admired in others and feared in ourselves. In reading Brene Brown’s book, I’m seeing that the values which our culture holds in esteem are counter-productive for mental, interpersonal, or social health. These are concepts I have been aware of, at many levels, for many years, but seeing it articulated in such a compact, vulnerable, and honest way is refreshing and perhaps a little bit of a slap to the face. In a world (this real word) where there are no gods, no actual ka, and no Dark Tower weaving our fate, what are we to do? There is no actual ka-tet; no overarching and unavoidable power forcing us together in circumstances where intimacy is almost unavoidable. We will not literally experience the inner minds of others in order to draw them to our world, like with The Dark Tower’s second book, but we might be able to take a few pages from book three onward into our own lives. Whether it is shared traumatic experiences, overcoming uncertainty and fear of our capabilities, or facing death together there are things which we, as real people, can relate to in book three and many other examples of literature, mythology, etc. In walking our own paths towards our goals, we find ourselves together and have a desire, almost a need, to share our stories, find strengths and skills encouraged by each other, and to dare (greatly) to achieve successes together we will inevitably create bonds. These bonds may be rare, but however many of these deep bonds you have in your life, for your father’s sake appreciate them and cultivate them well. This is what family is. This is the only refuge of the meaningless, cold, empty universe which cares not if you are happy, sad, or bored. It is only with the people we walk the path with that make the difference between living well and living poorly. There is a moment, I believe it is in the early chapters of book three (it’s all a blur), where Roland is thinking to himself about what he has done (there was a boy!/there was not a boy!) and the tension for his quest for the tower and the relationships he is forming. He is reminiscing how many have fallen next to him in his quest. In a sense, he has sacrificed them all, and this haunts him. He’s thinking about the balance for the ultimate goal and how he treats the people who walk with him. It occurs to him that this developing ka-tet provides him with an opportunity for redemption, to change his ka. Whether he succeeds in this redemption is up for debate, but the moment of realization holds powerful emotional potency for me. 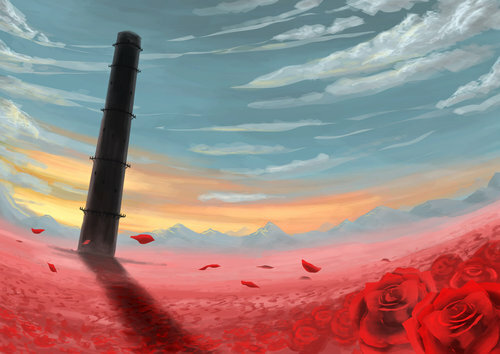 He stands at a cross-roads, of sorts, looking back at the many people lost in his path of the Tower. He has sacrificed so many others for his quest, and the moment when he becomes aware that he’s gathering more sacrifices, like a snowball rolling down a hill gathers more snow, he decides not to be a monster. For if he were to become that monster, he would sacrifice everything that his quest represents. Would he hurl his friends, like weapons, at anything in his path? Will his ka-tet be another means to his ends? Such is the future; all of our futures. The ends, he realizes, do not justify the means. Utility, consequentialism, and all other mere goals are not enough to rationalize the path he could take. He recognizes that in the quest for his goal, he is almost certain that these people will almost certainly die like his Hawk, David, which he chose as a weapon in his very first step in the direction of the Tower (whether he knew it then, or not). But he decides, in that moment, that he will not use his new ka-tet as mere tools, as weapons. He will make them partners, and share a goal with them. All the while knowing that they may all die, in this quest. As we all, eventually, will. 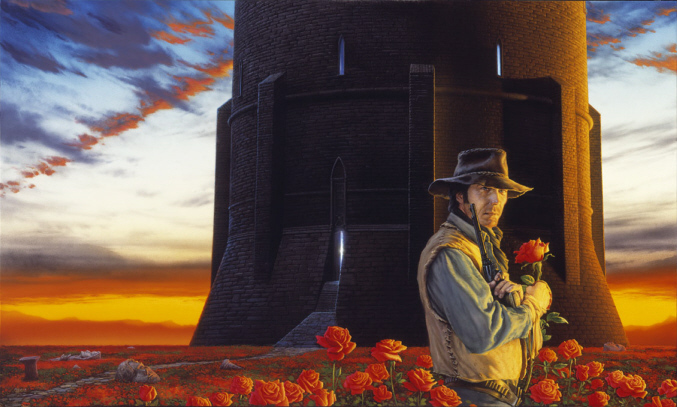 If you have not read The Dark Tower, but you want to, I want to alert you to something. There is a point, late in the last book (book 7), where Stephen King gives you a choice. He tells you to stop reading. But before this, earlier in the book, he also asks you to stop and appreciate a moment of victory. He reminds you to stop, take a look around, appreciate the circumstances you (because you’re invested in his characters, hopefully) are in, before moving on. Later, he simply asks you to stop reading. In both cases, you have a choice. In the first, the choice is whether you will take a break in your reading at that point and reflect on the gathered ka-tet and appreciate them, or simply turn the page. Later, your choice is whether to keep reading at all. King actually suggests, knowing you will almost certainly not do so, you to put the book away and not finish the story. The reasons for this are not important for us here (it’s also a spoiler), but it is this kind of moment which stands stark against the wall of eternity, for me. We need to stop, occasionally, and recognize what we have in our lives. We need to halt, take stock, and appreciate when there is something to appreciate, so that we can look back later and see those moments for what they were; beauty, love, and good feelings. But there may also come a time, in our stories, where there may be nothing left to see. There may be times when you should put the book away. And yet we do not, much of the time. The first time I read book 7, I actually did put the book down, and didn’t continue immediately. I thought, seriously, about taking the advice and not finishing the book. I walked away, thought about it, but inevitably picked it up again. I wanted to know, needed to know–burned to know–what would happen. Many uncertainties and blind-spots in my life are represented by this metaphor, and no matter how much I might know that it’s better to walk away, I feel the pull of curiosity and (sometimes) hope. What happened next in the book, in both cases where I paused, was hard to read even if it was necessary and compelling. We all have our Dark Towers to climb, I suppose. Perhaps it is better to not open that door, when we get to it. Perhaps we would all be happier if we simply took in the sight of reaching our destination, then moved on. But as Eve learned (metaphorically, of course), the fruit is too tempting. And just like Eve, warned against tasting the fruit, no matter how long you may be warned against the consequences of such an action, eventually, in all of eternities (and eternal returns; yes, even Nietzsche is relevant to The Dark Tower) you will eat the fruit, open that door, and climb that Tower. Imagine Eve, obediently avoiding the fruit for years, decades, millennia! Eventually, curiosity will get the better of her. Imagine a reader, at the end of a 7 book series, poised at the edge of the secrets of the story and never finishing it (I imagine at least a few have done so…so far). Gods! No creature capable of curiosity can withstand such a temptation forever, if forever were given to us. In eternities contains all things, I suppose. We want to know. We want to understand. We can avoid looking for a while, but eventually, we must peek. I see the inner lives of people the same way. My tower is understanding, of myself and of others with whom I walk the path of the beam. Many have been lost from my path, whether through death, enmity, or because we were questing for different Towers, ultimately (“Go then. There are other worlds than these”). And each meeting and separation is a moment of choice, where we have the choice of putting the book down or to turn the page. Sometimes, I turn the page and experience the heart-break that follows, and sometimes I put the book down. Sometimes, I turn the page and find my tower where intimacy, vulnerability, and love welcome me in. And perhaps, worst of all, sometimes I put the book down, and leave the hope of all that is beautiful behind. We don’t know what is inside each Tower, and whether we open them, walk away, or stand with curious grasps at the handle to that great door with indecision, those moments tell our stories. I look forward to the many quests for towers I will find, and I hope that those who walk the path with me will not sacrifice me, or be sacrificed by me, on the way to their own towers, because that way lies madness. Because we are the only real towers, dark or not. All the other towers are illusions, idyllic distractions, and ultimately vanity. Just like the Dark Tower series, the beauty is in the quest itself, not any hypothetical goal. All the goal will do, ultimately, is put us back on the path where we will either make the same choices or try something else. As Nietzsche observed, if we look at any moment in our lives as a metaphor for all choices, as an option to do this again, eternally, how would we behave? With such a perspective, does the goal matter? If we are forced to reflect on this life and all its choices, would we do the same? As we approach each Dark Tower, each person, will we open it? Will we walk the path with them? Will we hurl them as weapons? Will we sacrifice them for something else? There is only one final destination we will all approach, either suddenly or with clear foresight. That “clearing at the end of the path” is the only goal we all must travel to, and no Tower lies there. But what friends, family, and ka-tet we bring with us to the edge of that clearing will allow us to look back at our lives with the complexity and unambiguous reality. What we see there may cause us pain, a smile, and most likely both. It’s only what happens before that which matters. Make the most of it. 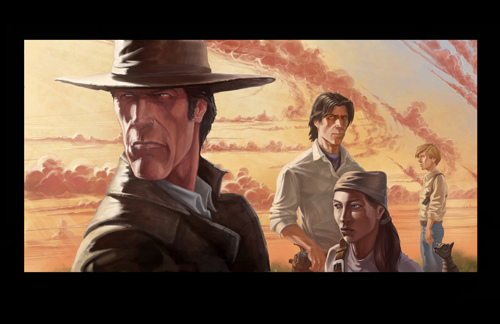 I love the Dark Tower books so much, and I find your interpretation moving and persuasive. I did not pause very long at either of the two breakpoints when I read book 7, but I’m inspired now to take your advice (and King’s)… life is full of roses too beautiful and too important to be taken for granted. Thank you for writing this. I prefer karass” from Vonnegutt’s Cat’s Cradle, but I believe the terms are fairly analogous.